What was once Reno's Rink on the River got a new location and new name in 2014. 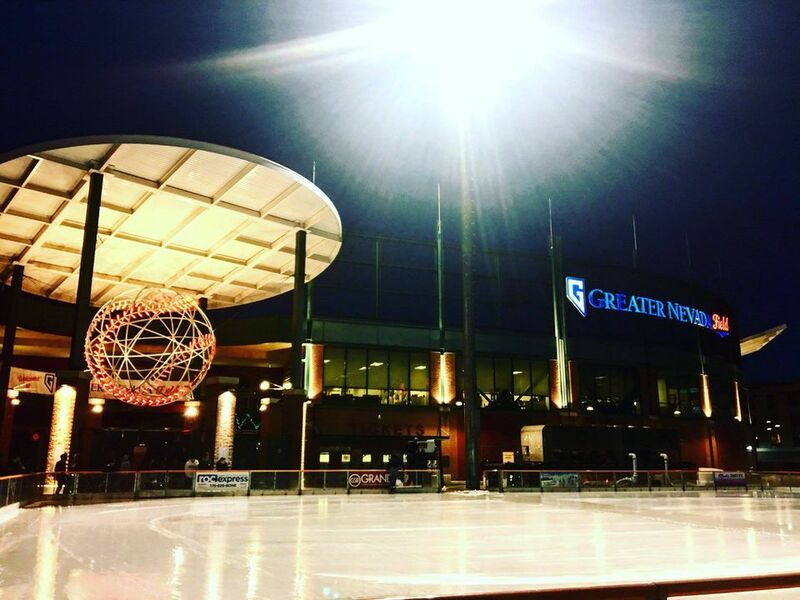 It's now the Downtown Reno Ice Rink at Greater Nevada Field, home to the Reno Aces Ballpark, at 250 Evans Avenue. The rink is open seasonally; for the 2018-2019 winter season, it will be open November 21, 2018, to January 21, 2019. Since the rink is outside, it will not be open in inclement weather. Check the website to be sure it is open before you put on all your gear and head out the door. The Downtown Reno Ice Rink at Aces Ballpark is right next to the Freight House District. After a skating session, duck into one of the restaurants or bars there to get warm and have something to eat and drink. Check out Arroyo Mexican Grill, 250 Lounge, and Duffy's Ale House. Reno Aces giveaway days, with different giveaways each day. Some special promotional items include fleeces, jerseys, bobbleheads, and lunch boxes. It's best to get there early on giveaway days because supplies are often limited. Free skate rentals for students on selected days. Exchange canned food for the hungry for free admission to the skating rink. The skating rink also offers a variety of special experiences. Sign up for field trips and group outings, throw an ice skating birthday party, or reserve the entire rink for a large-scale event. You can get food right there at the rink for your skating party or big skating bash. Prices and schedules change over time, so check the website for specifics before you head out. And if you're qualified, take advantage of money-saving perks like senior and student discounts. You can also buy punch cards to be used as needed over time. If you are curious about what's going on at the rink or wondering if it's getting crowded in the area, you can have a look for yourself in real time at the outside of the rink and baseball stadium live through this webcam.